As global temperatures rise, the lives of countless plants and animals are changing in response. That includes king penguins, which a new study predicts will see profound, climate-driven changes in their numbers and the location of their breeding grounds over the next century. King penguins (Aptenodytes patagonicus) live and breed on a collection of small, rocky islands that ring Antarctica, in a swath of frigid maritime territory known as the “subantarctic.” The birds feast on small fish and squid in nearby waters, which exist in rich quantities because of the Antarctic Polar Front (APF), a convergence of warmer water from the subantarctic meeting the colder waters surrounding Antarctica. This zone experiences nutrient-heavy upwelling, supporting great swarms of plankton and krill, which drive the subantarctic food web. As the world gets warmer, the APF is expected to drift further and further south. But king penguins can’t just gradually follow the poleward migration of their hunting grounds, because their breeding grounds are static, on ice-free parts of islands. They have to use other islands as stepping stones. Research published today in the journal Nature Climate Change makes predictions about how this challenge will unfold over the 21st century, suggesting that most of the species will be stuck between a rock island and a hard place: either they abruptly move to other islands, or die out. The researchers used information about king penguin ecology and historical population trends, as well as climatic forecasts, to model where king penguins could be expected to persist by the year 2100. Then, they used DNA to reconstruct the prehistorical population trends of the species. When they compared the thousands of years of population shrinkage, rebounding, and migration with their model, the researchers determined that king penguins suffered extreme consequences from past climate change acting on the extent of sea ice, and the location of the APF. Their predictions are startling. Under warming produced by “business-as-usual” greenhouse gas emission levels, many northern islands may be totally abandoned due to the waning foraging grounds. Since king penguins take a long time to reproduce, and their current genetic diversity is very low, they aren’t expected to adapt fast enough to deal with the shifting food source. This means that about 70 percent of the species’ 1.6 million breeding pairs would be threatened with survival by 2100. Forty nine percent of all penguins would outright lose their habitats. Another 21 percent, mostly breeding on islands off of the tip of South America, would experience dramatic alterations in their habitat quality as foraging grounds become nearly too far away to access. While this is a grim vision of the future, it’s not known how much of this loss could be recouped by penguin resettlement and population regrowth. 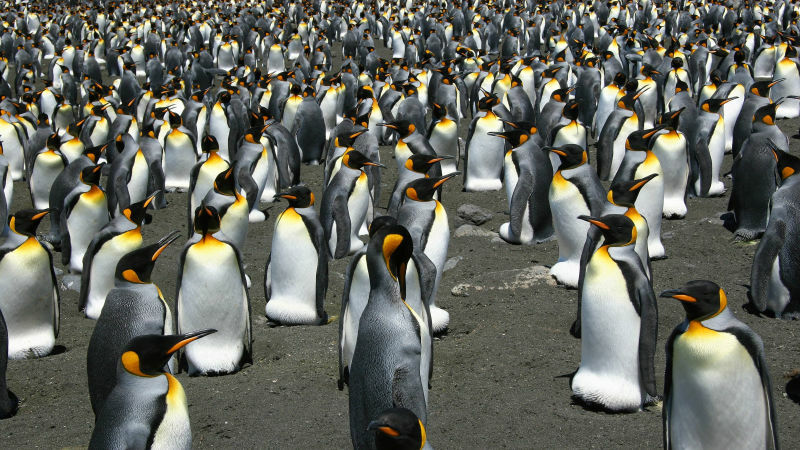 Today, Bouvet Island in the South Atlantic is too ice-bound to support a king penguin colony, but with elevated temperatures, it could become ripe for colonization. Other places like South Georgia could see swelling populations as foraging conditions improve there. It’s also possible that the model is too conservative, because it can’t take into account every potential repercussion of climate change. For example, ocean acidification, or changes in global ocean circulation processes, could mess with plankton numbers, throwing feeding grounds into chaos. Also, even if the penguins successfully colonize other islands, we don’t know how new competition with other native penguins would influence the long-term survival of those birds. Either way, this approach to understanding how cold-adapted species in fragmented habitats cope with climate change may be useful for predicting responses in other species with disjointed distributions. It certainly reminds us that the impacts of climate change will ripple far beyond humans. Join Prospect Park Alliance for a birdwatching walk and learn about Prospect magnificent array of birds and how to identify them! Think all gulls are the same? Join Prospect Park Alliance and take another look by exploring the Park’s nature trails and discover all the different species of gulls in the Park. This tour is led by the Brooklyn Bird Club and leaves promptly at 8am. Please review our general trip information and guidelines on this page. This is always a special walk. Just at the edge of winter, you will be greeted by lots of hungry birds, that eat right out of your hand. Frequently there are pockets of over-wintering birds. Great photo ops as you are close to the birds. Meet at the Refuge parking lot at 8 am. It is roughly a 2 mile walk to the beach and around the refuge. Dress warmly and appropriately. Bring binoculars! Bird seed will be provided. Meet at Brookwood Hall, Islip Town Park in East Islip on Irish Lane between Montauk Hwy and Union Blvd. Located in the heart of Massapequa, the preserve is one of the most beautiful parks in the area. We may see an assortment of song birds, waterfowl, and raptors. Directions: Follow Sunrise Highway to the Massapequa LIRR station, then follow the north side of the station to the parking lot across from the police station and park in the far eastern end. We’ll walk 4.3 moderate miles starting and ending at the Greenbelt Nature Center, with lunch at High Rock. This walk includes a gradual climb up Moses’ Mountain. Bring ample water and lunch. Wear warm clothes and sturdy shoes. To register for the walk please e-mail Hillel Lofaso at hillel5757@gmail.com or call 718-477-0545. Bird walks led by a member of SSAS are conducted nearly every Sunday morning from late August through early June. Walks are open to the public and are free of charge. We especially encourage youngsters to attend. All walks start at 9:00 A.M. There is no walk if it rains or snows or temperature is below 25°F. Greetings! This is the New York Rare Bird Alert for Friday, February 23, 2018 at 8:00 pm. Unfortunately, due to technical difficulties we have not been able to completely record the tape recently, unexplained gaps continuing to appear in the message. The highlights of today’s tape are LITTLE and BLACK-HEADED GULLS, PINK-FOOTED, BARNACLE and GREATER WHITE-FRONTED GEESE, TUNDRA SWAN, BARROW’S GOLDENEYE and KING EIDER, EARED GREBE and more. Even with waterfowl now on the move and a few expected early arrivals showing up in the area, this week’s report has a familiar ring to it. The Montauk PINK-FOOTED GOOSE was noted both days last weekend back on the pastures at the Deep Hollow Ranch on the south side of Route 27. Also in the Montauk area, the adult LITTLE GULL apparently moved away from the Point area, being seen Monday in a good-sized BONAPARTE’S GULL flock off Ditch Plains, and a male KING EIDER was a reported fly-by at the Point on Monday. On Wednesday, two BARNACLE GEESE were found on the pond at Gerry Park in Roslyn, but haven’t been seen there since – this pond is south of Papermill Road below Roslyn Pond. A GREATER WHITE-FRONTED GOOSE was spotted at Hook Pond in East Hampton Saturday, and the TUNDRA SWAN was still on the East Pond at Jamaica Bay Wildlife Refuge Wednesday, staying mostly up towards the north end. A few CACKLING GEESE also continue in the region. A drake BARROW’S GOLDENEYE was still off Crab Meadow Beach last weekend, this Northport site reached from the end of Waterside Road. The wintering female BARROW’S GOLDENEYE in Fire Island inlet was spotted again last Saturday off the west end of Oak Beach Road. That site is also where the EARED GREBE was still present last Sunday. A decently plumaged male KING EIDER was still at Old Field Point last Sunday, this site at the end of Old Field Road also hosting a LESSER BLACK-BACKED and up to four ICELAND GULLS. Sightings of BLACK-HEADED GULLS this week included an adult at Brooklyn’s Plumb Beach last Saturday and one Monday at Calvert Vaux Park, as well as the adult at New Rochelle’s Five Islands Park on Wednesday. A GLAUCOUS GULL was still at Orient Point State Park Saturday, and ICELAND GULLS featured one on Central Park Reservoir Thursday and one last Saturday at Coney Island Beach. Two RED-NECKED GREBES at unexpected locations included one on the Alley Pond Park Restoration Pond next to the Douglaston Parkway from Saturday to Wednesday and another on Lake Ronkonkoma Monday. A ROUGH-LEGGED HAWK was spotted on Ruffle Bar in Jamaica Bay as viewed from Floyd Bennett Field last Wednesday. AMERICAN BITTERN continues to be seen along Dune Road west of the Ponquogue Bridge. Along with the brief warm weather spell came the first of the early spring’s AMERICAN WOODCOCKS, hopefully not to be trapped by a cold snap like they were last year. Also appearing are some KILLDEER and WOOD DUCKS and flocks of COMMON GRACKLES and RED-WINGED BLACKBIRDS, as well as a few RUSTY BLACKBIRDS. Walk into any casual restaurant and before you’ve finished looking at the menu, your waiter will probably give you a glass of cold water. There might be a lemon in it. There might be ice. There’s probably a plastic straw sticking out of the cup. Perhaps this morning you slurped up your daily dose of caffeine through an iconic green straw, and then tossed it into a trash can along with your plastic coffee cup without a second thought. The point is, Americans use a lot of straws, and we rarely stop to think about the environmental impact of the hollow, single-use tubes that we discard daily. A state representative in California is hoping to change that. Assemblyman Ian Calderon introduced a bill in January that would ban single-use plastic straws in sit-down restaurants. (The bill’s first draft didn’t apply to most take-out or fast-food establishments.) The bill stirred up a lot of controversy around the harsh fines and possible jail time it proposed for violators, but Calderon’s office has since offered amendments that wouldn’t actually make criminals out of waiters who give customers straws. But why go through the lengthy process of banning straws in the first place, instead of encouraging recycling? It turns out that in the United States, we don’t actually have systems in place to effectively recycle most straws. They quite literally fall through the cracks. That’s how they end up in the ocean, and most viscerally, lodged into the noses of sea turtles. So why don’t we just make our recycling machines better at grabbing straws? Americans have a pretty dismal track record for recycling in the first place, and most of the plastic recycling that’s collected is shipped overseas to be sorted and manufactured into other products, so there’s little incentive to do the dirty work at home. But even with better sorting techniques or higher recycling rates, Hoover says that most recycled plastics end up in products like lumber that we don’t use every day. “That means you have to keep going back and getting more virgin fossil fuel material for new cups, new straws, and new bottles,” she explains. Reducing and reusing, it turns out, are actually the most important of the three R’s you learned in elementary school. That’s why, in theory, the plastic straw ban could be effective. It could reduce the overall plastic straw waste produced in California. The ban also reminds customers that they have a choice in consuming things so mundane we don’t even think about them. And it puts pressure on manufacturers to design more environmentally-friendly options. The straw ban is more than just a theoretical proposal. California banned single-use plastic grocery bags in 2016, and Ocean Conservancy estimates that bags now make up around three percent of the trash in California’s beaches, down from 7.4 percent in 2010. While the image of littered beaches and injured animals can spur action on environmental problems, there’s another huge problem that we can’t see as clearly: microplastics. These sesame-seed sized particles shed from all the myriad plastic products we use every day, from our clothes to our cosmetics and, yes, our straws. “They’re everywhere—not just in the water, not just in the soil, but in the gas phase as well, in the air,” Chandran says. And not much is known about the potential health and environmental impacts of miniscule plastic debris floating around everywhere. In terms of reducing plastic waste, Chandran says it’s pretty clear that reducing use is a more effective solution than recycling. “There’s no reason for us to be adding plastics products into the environment, from a very black and white perspective,” he says. Meet at the Jamaica Bay Wildlife Refuge for a slide program and hike around the reserve with naturalist Don Riepe. Just because it’s winter, doesn’t mean that there aren’t interesting birds to discover in Green-Wood. 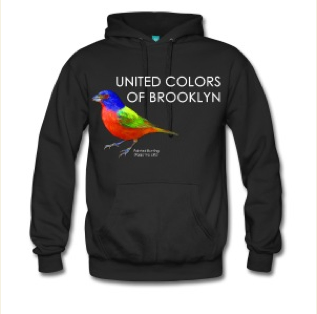 For some bird species that migrate south after the breeding season, Brooklyn is their Miami during the cold months. Spend the early morning exploring the cemetery, looking for overwintering waterfowl, nuthatches, woodpeckers, sparrows, finches and any half-hardy birds that decided to stick around. By February we’ll see some of the early north-bound birds beginning to trickle back into the area. Use street parking on the westbound side of Merrick Road. The park is four blocks west of the Wantagh State Parkway. For more information or in case of questionable weather conditions, please phone Joe at 516 467-9498. Tour leader and ecologist Helen Forgione will show you how to identify trees in winter and interpret signs of wildlife, with a special eye toward owls and tracks. Greetings! This is the New York Rare Bird Alert for Friday, February 16, 2018 at 9:00 pm. Unfortunately, due to technical difficulties we have not been able to completely record the tape recently. The highlights of today’s tape are MEW GULL, LITTLE, BLACK-HEADED and GLAUCOUS GULLS, PINK-FOOTED, ROSS’S and GREATER WHITE-FRONTED GEESE, BARROW’S GOLDENEYE, KING EIDER and EURASIAN WIGEON, EARED GREBE, and another PURPLE GALLINULE. Last Saturday out at Orient Point an adult MEW GULL was spotted and fortunately nicely photographed before it shortly took off and flew north towards Connecticut. Two GLAUCOUS GULLS were also at that location, one still there Thursday. A ROSS’S GOOSE was still feeding on the lawns at St. Charles Cemetery in Farmingdale at least to Monday, this bird usually roosting overnight at Belmont Lake State Park to the east. A GREATER WHITE-FRONTED GOOSE was still visiting Tung Ting Pond in Centerport to Sunday, with another in Northport Saturday. A drake BARROW’S GOLDENEYE was still off Crab Meadow Beach on Thursday, this in Northport as approached from Waterside Road. The adult male KING EIDER around Jones Inlet was seen Monday across the inlet near Meadow Island, viewable from the Jones Beach West End Coast Guard Station area. A female KING was in Shinnecock Inlet Monday, and an immature was still at Old Field Point at the end of Old Field Road today. A drake EURASIAN WIGEON was on Avon Lake in Amityville north of Route 27A midweek. The adult LITTLE GULL was still present off Montauk Point at least to Wednesday, the bird usually spotted from the restaurant overlook as it and accompanying BONAPARTE’S GULLS continue to circulate around the Point. The number of COMMON EIDERS and BLACK, SURF and WHITE-WINGED SCOTERS there is also very impressive, and a few RAZORBILLS continue there as well. Last Saturday two BLACK-HEADED GULLS featured the immature on Prospect Park Lake and the adult at Five Islands Park in New Rochelle. A GLAUCOUS GULL was at Montauk Point last Saturday and on the Montauk harbor west jetty Monday, where an ICELAND GULL also continues. Other ICELANDS include Brooklyn sightings at Coney Island and Gravesend Bay and three noted at Old Field Point last Monday. LESSER BLACK-BACKED GULLS include one at Brooklyn Army Terminal Pier Four Wednesday and one off Coney Island Monday, with another reported from Westhampton Beach Marina Wednesday. An EARED GREBE continues in Fire Island Inlet as viewed from the western end of Oak Beach Road, with another reported from the bayside at Gilgo Monday. Two RED-NECKED GREBES were off the Timber Point marina Sunday, another in Gravesend Bay Monday. Interesting Suffolk County birds include three BLACK VULTURES in Riverhead, seen recently around Roanoke Avenue and the Supreme Court complex, and a PILEATED WOODPECKER at West Hills County Park in Melville. Much more interesting, though, was the recent uncovering of a third Long Island PURPLE GALLINULE, this found in Rockville Center January 14 and expiring two days later. The date range for the three now deceased PURPLE GALLINULES was from January 13th in Manorville to January 16th in Southampton, an amazing dispersal with a very unfortunate ending. In 2010 this tiny North American wren was split taxonomically between the eastern and western species. Previously known entirely as the Winter Wren, its western cousin is now called the Pacific Wren. David Sibley has a nice comparison of the differences here. It is also closely related to the Eurasian Wren (Troglodytes troglodytes). 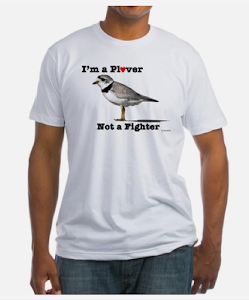 Despite its common name one is more likely to encounter this species around Brooklyn and NYC during the spring and fall migration and not during the winter. 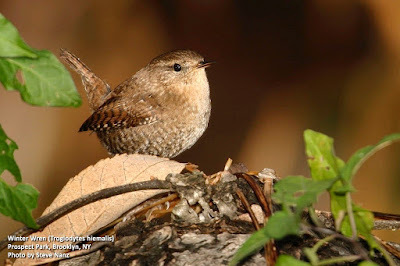 The Winter Wren breeds in coniferous forests from British Columbia east to Newfoundland, and south to New England and the Great Lakes region. They overwinter across the eastern half of the United States, south to the Gulf Coast. The Winter Wren's conservation status according to the IUCN Red List is Least Concern. It’s scientific name, Troglodytes hiemalis, means cave dweller, of winter. Eliminating polystyrene foam cups starting this year, the company will eventually be saving 1 billion plastic coffee cups from the waste stream annually. In a perfect world, we would all have reusable coffee cups that we carried around with us wherever we went. But until that ginormous sea change happens, the next best thing would be to see major coffee chains using sustainable materials in their single-use coffee cups. Starbucks has taken a lot of heat, so to speak, for adding 4 billion non-recyclable cups annually to the landfill – which may stand out even more now that Dunkin’ Donuts has announced a transition away from polystyrene foam cups. As part of its commitment to serve both people and the planet responsibly, Dunkin’ Donuts, a leading retailer of hot, brewed coffee, today announced plans to eliminate all polystyrene foam cups in its global supply chain beginning in spring 2018, with a targeted completion date of 2020. In U.S. restaurants, Dunkin’ Donuts will replace the foam cup with a new, double-walled paper cup. The majority of Dunkin’ Donuts’ international markets are currently using paper cups, and the brand will work with its franchisees to eliminate foam cups from the remaining international markets by the 2020 goal. Dunkin’ Donuts’ transition to paper cups will remove nearly 1 billion foam cups from the waste stream annually, notes the release. The new cup is made with paperboard certified to the Sustainable Forestry Initiative Standard. It is a positive development and aligns with the company’s other commitments, like eliminating artificial dyes from items on the menu, building more energy-efficient restaurants, and partnering with the Rainforest Alliance to source certified coffee. In 2014, they announced their commitment to source 100 percent responsible, deforestation-free palm oil. The cups will be introduced at all Dunkin’ Donuts restaurants in New York City and California in spring 2018, and will be phased in across the U.S. as supplier manufacturing capabilities ramp up. Let’s hope other coffee chains are not far behind. In the meantime, we still advocate for refillable cups; but we'll be happier to take paper over plastic in a pinch. The coast or northeast Massachusetts is the winter home to a spectacular array of seabirds. Our masterful Naturalist will guide this special trip around the region in search of such stunners as Harlequin Duck, King Eider, Barrow’s Goldeneye, Red-necked Grebe, Rough-legged Hawk, Iceland and Glaucous Gulls, Purple Sandpiper, Black Guillemot, Black-legged Kittiwake, Razorbill, and Snowy Owl. It’s also possible to see Dovekie, Thick-billed Murre, and Eastern and Short-eared Owls. Add these to your year(or life) list this month! Cost: $100/members, or $130/non-members and we’ll credit $30 to an annual membership; travel, lodging, and meals not included. Note: The fees for this trip help support environmental education so we can continue to deliver high-quality programs for free. Please register with Susan at info@bedfordaudubon.org or 914.302.9713. An inclusive bird watching club dedicated to providing a safe opportunity to connect with the natural world in urban environments and having an ongoing conversation about intersectionality, activism, and the rights of all women, non-binary folks, and members of the LGBTQ+ community. Massapequa Lake is at the southern end of Massapequa Preserve. Use street parking on the westbound side of Merrick Road, west of Lake Shore Blvd. New York City is home to an amazing abundance of wildlife. Our Urban Park Rangers will guide you to the best wildlife viewing spots in the urban jungle. Our good friend Bob Adamo will be leading this field trip on Presidents' Day weekend. Montauk Point and nearby areas are famous for fantastic winter birding. Target birds include loons, grebes, scoters, Northern Gannet, Harlequin Duck, Common Eider, Long-tailed Duck, Razorbill, and more! Watch your email Inbox and check back here for details coming soon! Greetings! This is the New York Rare Bird Alert for Friday, February 9, 2018 at 8:00 pm. Unfortunately, due to technical difficulties we have not been able to record the tape recently. The highlights of today’s tape are PINK-FOOTED, BARNACLE, ROSS’S and GREATER WHITE-FRONTED GEESE, BARROW’S GOLDENEYE, HARLEQUIN DUCK and KING EIDER, LITTLE and BLACK-HEADED GULLS, DOVEKIE and EARED GREBE. Water birds, not unexpectedly, continue to dominate our regional rarities. The Montauk PINK-FOOTED GOOSE continues to move between the Deep Hollow Ranch farm fields on the south side of Route 27 and the Montauk Downs golf course, noted at the farm Tuesday and on the golf course last Sunday and yesterday. The BARNACLE GOOSE, originally found at Playland Park in Rye on January 29th, has recently spent most of its time on local private golf courses in Rye and Harrison, but today it, as well as its companion CACKLING GOOSE and most of the CANADA flock, visited a mill pond in Rye off Kirby Lane, flying in early and leaving around 10 am, headed back inland. The mill pond does have a small parking turnout on Kirby Lane but is otherwise surrounded by private property. This area is just east of Playland Lake, which the geese will hopefully return to once it thaws. This week’s ROSS’S GEESE include one recently spending the overnight on the lake at Belmont Lake State Park and feeding at St. Charles Cemetery to the west in Farmingdale, and two ROSS’S found off Doctors Path north of Riverhead last Sunday. A GREATER WHITE-FRONTED GOOSE has also been noted at Belmont Lake State Park since last Sunday, with another seen again on Tung Ting Pond in Centerport Tuesday. The TUNDRA SWAN on the East Pond at Jamaica Bay Wildlife Refuge was present at least to last Saturday, and two were still on Hook Pond in East Hampton last Sunday. A drake BARROW’S GOLDENEYE has been present recently off Crab Meadow Beach in Northport, with the female still in Fire Island inlet off Oak Beach Road last weekend. KING EIDERS around the Point Lookout jetties have included drake and immature males and a female or two, while out in the Montauk area last weekend sightings of KINGS featured young males off the Point and at Culloden Point, with a female at Ditch Plains. At least five HARLEQUIN DUCKS remain around the Point Lookout jetties, with a female also at Ditch Plains last Saturday. A KING EIDER at Old Field Point at the end of Old Field Road last Saturday was just one of several nice birds there, including a BLACK-HEADED GULL plus two ICELAND and one LESSER BLACK-BACKED GULLS. The best GULL, however, was the adult LITTLE GULL found off Montauk Point last Friday afternoon and continuing there over the weekend and noted Tuesday as well, usually near a small group of BONAPARTE’S GULLS. Last weekend the Montauk area also provided several other nice birds, perhaps topped by a DOVEKIE that visited the Point briefly Sunday morning. The large congregation of ducks there was a highlight in itself, supplemented by an estimated 80 RAZORBILLS on Sunday, when an EARED GREBE was also spotted at the sound end of Lake Montauk. Up to seven ICELAND GULLS were thought to be around the Montauk harbor inlet, and single GLAUCOUS GULLS were spotted off the Point as well as at the harbor inlet Tuesday. Besides the adult at Old Field Point, other BLACK-HEADED GULLS included an immature visiting Prospect Park Lake Tuesday to Thursday and an adult at Bush Terminal Piers Park in Brooklyn Wednesday, with the adult continuing around Five Islands Park in New Rochelle. The Fire Island inlet EARED GREBE was still off the west end of Oak Beach Road last Sunday. A LAPLAND LONGSPUR was spotted around Lot 2 at Jones Beach West End today. 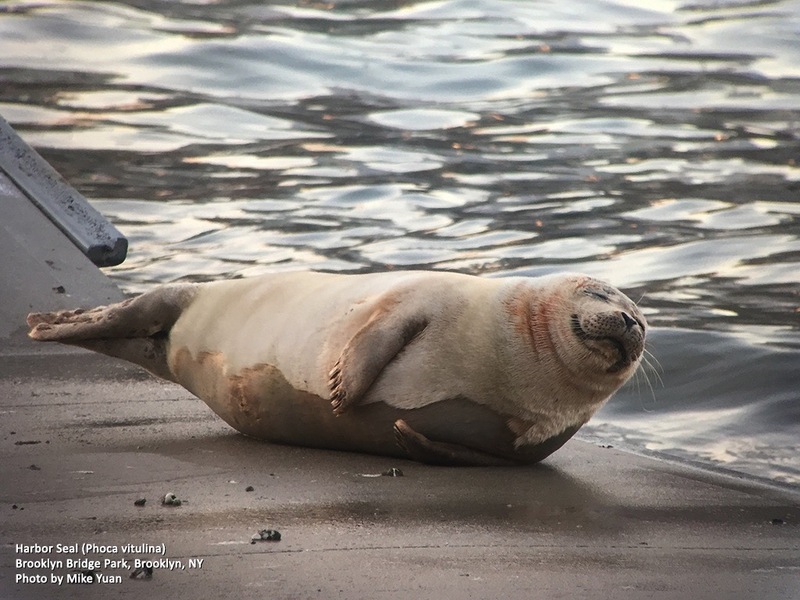 For various reasons, not the least of which is cleaner coastal waters in the Big Apple, marine mammals are being seen more regularly. As I've reported here and on my Twitter account, Harbor Seal sightings around coastal Brooklyn during the winter months is fairly common. What IS unusual is one hauling out at Brooklyn Bridge Park to take a siesta. I thought I might take a moment to remind New Yorkers how to behave around these incredible animals. All marine mammals are protected under the Marine Mammal Protection Act. NOAA guides state that when observing wild dolphins, porpoises, and seals you must do it from "safe distances of at least 50 yards (150 feet) by land or sea." As more of these at risk animals come in closer contact with urban environments it is critical that we do our best not to disrupt their normal behavior. 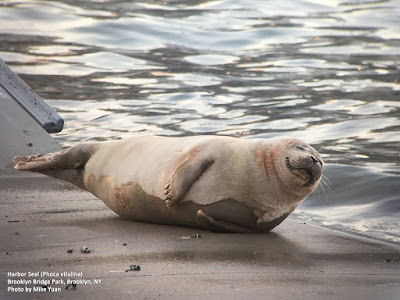 Here is a detailed page of information on the Harbor Seal (Phoca vitulina) from the Seal Conservation Society. If you are lucky enough to see a Harbor Seal or any marine mammals around New York City, the best way to observe them is through binoculars. If you decide to try and get close remember they are wild animals and you could also get slapped with a very substantial fine. One of my favorite waterfowl, the Redhead is a medium-sized diving duck with a vibrant red-copper colored head and bright blue bill with a black tip. 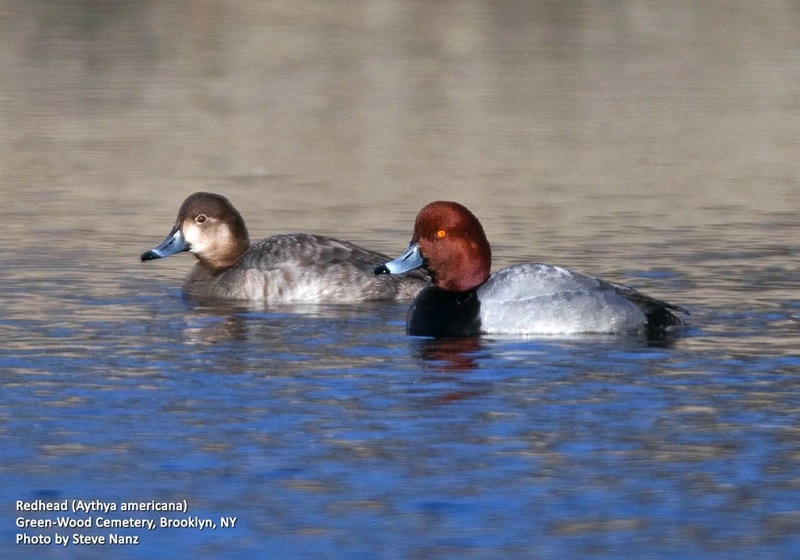 Similar to the Canvasback, they are smaller with a rounder head, smaller bill and a grayer back. Feeding mainly on aquatic plants, their diet also includes mollusks, aquatic insects, and small fish. Female Redheads are “brood parasites” and will lay their eggs in other species' nests. They use the nest of at least 10 species of waterfowl including American Wigeon, Canvasback, Gadwall, Mallard, Northern Pintail, Northern Shoveler and Ruddy Duck. There are also records of them laying their eggs in the nests of American Bittern and Northern Harrier! Redheads breed in the northern prairies of the United States and Canada from Alaska south to Colorado and the intermountain marshes of the west and southwest. They overwinter across the southern United States from California to Florida and south into Mexico. Eastern populations will winter in South Carolina, although they are declining in the east. Estimates speculate that 80% of North America’s redhead population overwinter in the Laguna Madre lagoon of Texas and Mexico. This species conservation status according to the IUCN Red List is “Least Concern”, due to their extremely large range and increasing population trends. The etymology of it’s scientific name, Aythya americana, is Gr. aithuia unidentified seabird mentioned by Aristotle, Hesychius, and other authors, and America. Just a few months after Tesla completed the world's biggest lithium-ion battery installation outside of the Hornsdale wind farm in South Australia, the Australian state and the electric vehicle-slash-energy company look like they're ready to partner again. This time, South Australia wants to build a 250MW virtual power plant. The plant will consist of thousands of solar panels and batteries running software that decides when the batteries charge and discharge to maximize efficiency and value to the grid. The build out will start with 1,100 public housing properties. Residents sign up if they're interested in the program, and a Tesla contractor comes out to the home and tries to outfit a solar and battery storage solution to the house in question. Join us at the New Croton Dam for a day of viewing our Nation’s symbol, the Bald Eagle. We’ll also be monitoring the local waterfowl and other birds, too! No registration necessary. Snow date Sunday, February 11. 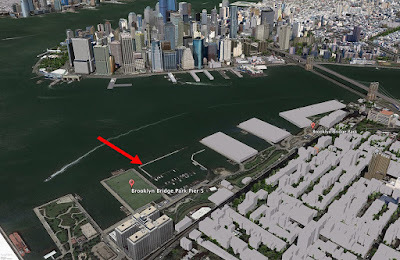 Meet 9 am at the Prospect Park Pergola entrance (Parkside and Ocean Ave.) No registration required. Leader: Dennis Hrehowsik Note: Nearest Train is the “Q” line to local stop Parkside Ave.
Meet at The Point/Lighthouse parking lot (Voted Warmest Rest Rooms in Winter, Suffolk County!) Dress appropriately!! Expect the worst and hope for the BEST!!! Seabirds galore, we will visit the Point, Camp Hero, Montauk Lake, Ditch Plains, The Ranch, TR Campground and any place birds may be reported! Join us for an introduction to the calls of backyard birds. Welcome to the second installment in our auditory birding series. Explore the littoral zone at low tide and walk along the edge of the sea. Join us in Croton Point Park in Westchester for a celebration of Hudson River’s eagles, hosted by the Teatown Nature Preserve. You can see both wild eagles by the river and captive eagles up close! There will also be music, food, heated tents, and activities for kids. Advance tickets are $17 for adults and $10 for children; day-of tickets are slightly higher. 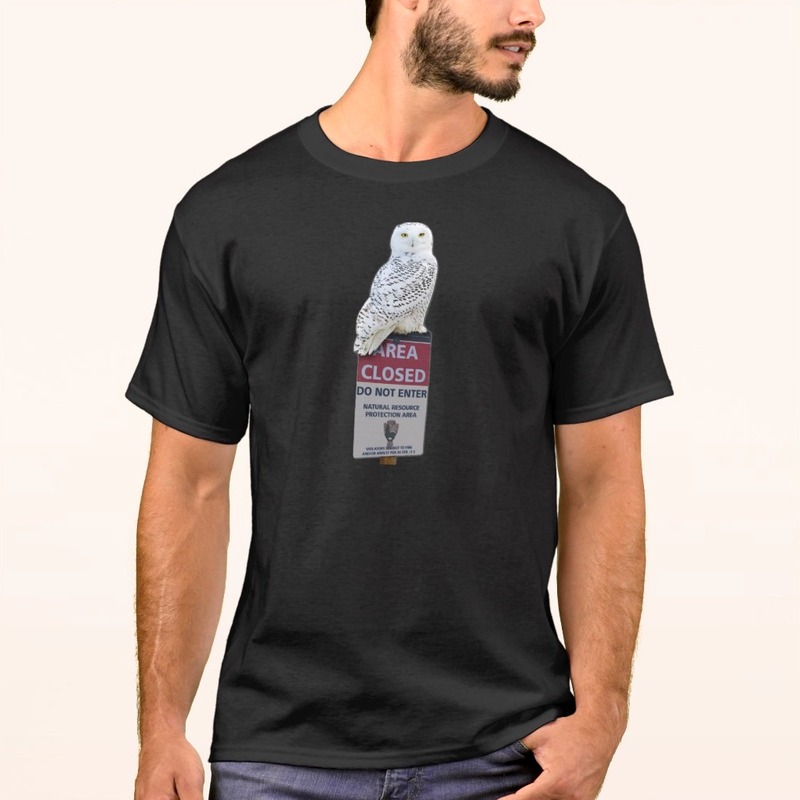 To purchase advance tickets and for more info visit https://www.teatown.org/events/eaglefest/. Directions: Take the Taconic State Parkway just past where it merges with the Sprain Brook, and take 9A north to its end in Crotonville. Continue north on route 9 for 0.7 miles then exit and follow signs into Croton Point Park. This 1600 acre park is on the Great South Bay in East Islip. The forest and wetland areas are home to a variety of winter bird species. Directions: Take the Southern State Parkway to the end and merge onto the Heckscher State Parkway. Follow signs to field 5. Enjoy a mid-winter walk to investigate the geology beneath the historic Princes Bay lighthouse. Naturalist Ray Matarazzo will discuss storm erosion at the Terminal Moraine. During the walk participants may find fossils. Winter storm action and erosion occasionally reveal glacial drift fossils from the Devonian Period, fossils which are millions of years old. Bring a magnifier. Meet in the Hylan Boulevard parking lot across from the CYO Community Center at Kenny Road. For more information contact Ray Matarazzo at 718 317-7666. This easy 3.5 mile loop walk takes us to a rich deep lowland woodlands and winding streams. We will focus on tree bark identification and look for overwintering plant. We will meet in the parking lot at the end of Eton Place off Richmond Avenue. To register for the walk please e-mail Hillel Lofaso at hillel5757@gmail.com or call 718-477-0545. From Sunrise Highway, turn north onto Broadway, Massapequa. Travel under the Long Island Rail Road overpass, then make the first right onto Veterans Boulevard (headed east). Go past the Massapequa train station and into the parking lot at the east end of the station. The preserve is directly east of the parking lot. 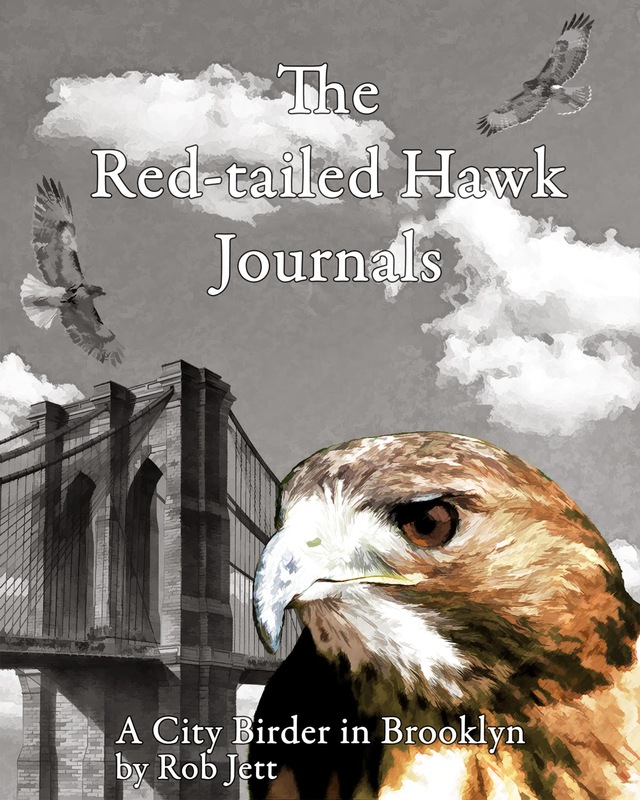 The Hudson River Valley hosts an impressive diversity of bird species in the winter. Observe birds in their winter habitats and explore Wave Hill with naturalist Gabriel Willow. New York City is home to an amazing abundance of wildlife. Our Rangers will guide you to the best wildlife viewing spots in the urban jungle. Appropriate for all skill levels. As Green-Wood Cemetery’s official “Birding in Peace” tour guide I’m frequently asked about conservation or habitat related projects that are in the works. Occasionally I am also grilled about some landscape related issues that may or may not be in the best interest of wildlife in the cemetery. In an attempt to answer all of your questions the cemetery has scheduled a birder forum. 1 - Express Green-Wood Cemetery’s commitment to birds and birders. 2 - Present efforts currently underway to support wildlife habitats. 3 - Listen to feedback from the birding community. Some other topics to be covered include native plantings, installing benches at the Dell Water, lawnmowers, and helping birders understand Green-Wood’s many constituencies. If you plan on attending the “Birder Town Hall”, the meeting will be held at the Modern Chapel, just to the right after the main entrance on 25th Street. Please RSVP on the Green-Wood Cemetery website here. Greetings! This is the New York Rare Bird Alert for Friday, February 2, 2018 at 8:00 pm. The highlights of today’s tape are BARNACLE, PINK-FOOTED, ROSS’S and GREATER WHITE-FRONTED GEESE, TUNDRA SWAN, BARROW’S GOLDENEYE, HARLEQUIN DUCK, KING EIDER, EURASIAN WIGEON, EARED GREBE and BLACK-HEADED and GLAUCOUS GULLS. With waterfowl providing most of this week’s highlights, new for the area was a BARNACLE GOOSE showing up Monday on Playland Lake in Rye, Westchester County. The goose daily except for Wednesday, when it was on a nearby mill pond, has been roosting in the morning on the lake ice with about 400 CANADAS and an accompanying CACKLING GOOSE; the birds tend to arrive around 8 am and are generally gone by noon, though the times do vary. The BARNACLE was seen leaving a local golf course late this afternoon, headed to an unknown overnight location. Interesting that this BARNACLE and CACKLING pair is presumably the same pair seen initially in Western Massachusetts and later around Westport, Connecticut before moving to Rye. The PINK-FOOTED GOOSE was still visiting the Deep Hollow Ranch in Montauk at least to Monday, usually seen on the pastures on the south side of Route 27 east of town. If not there, check the Montauk Downs Golf Course. A ROSS’S GOOSE has been roosting overnight recently on the lake at Belmont Lake State Park and has been found feeding with CANADAS during the day at St. Charles Cemetery in Farmingdale, west of Belmont Lake. A GREATER WHITE-FRONTED GOOSE was seen at least to Monday on Tung Ting Pond in Centerport. A TUNDRA SWAN was still present on the East Pond at Jamaica Bay Wildlife Refuge through Wednesday. Among the ducks, a drake BARROW’S GOLDENEYE was spotted Thursday off Crab Meadow Beach in Northport, while the female in Fire Island Inlet was still in a COMMON GOLDENEYE flock as viewed from Oak Beach Road last Saturday. A young male KING EIDER was still present yesterday around the jetties off Point Lookout, best approached from Point Lookout Town Park, and a decent number of HARLEQUIN DUCKS also continue there. Another young male KING was present at Old Field Point up to Thursday at least, this at the end of Old Field Road. And drake EURASIAN WIGEON continue on the Sayville Mill Pond on the north side of Montauk Highway and at Mill Creek on the southwest side of Staten Island. Getting back to Old Field Point, an adult BLACK-HEADED GULL spotted there Monday was still present today, and other GULLS there featured up to three ICELAND and a LESSER BLACK-BACKED. An adult BLACK-HEADED GULL also continues at Five Islands Park in New Rochelle, and an immature visited the middle parking lot off the Belt Parkway at Gravesend Bay in Brooklyn Saturday. A GLAUCOUS GULL was still on the East Pond at Jamaica Bay Refuge Sunday, and out east single GLAUCOUS GULLS were noted at Montauk Point Saturday and Orient Point Tuesday. An ICELAND GULL visited Central Park Reservoir last Saturday, with another at Crab Meadow Beach Thursday. Five RAZORBILLS were off Montauk Point Thursday, with a single spotted at Breezy Point Saturday. An EARED GREBE was still near the docks off the western end of Oak Beach Road yesterday, and last Saturday an EARED GREBE was spotted at Pelham Bay Park in the Bronx, this bird off Rodman’s Neck and spotted there again Thursday as viewed from a marina just over the City Island bridge. One of a few regional RED-NECKED GREBES has also been around City Island, with others noted off Floyd Bennett Field, Riis Park and at Timber Point in Great River. As part of the nice continuing invasion of SNOWY OWLS, last Sunday four could be seen along the marshes and offshore islands as viewed from Jamaica Bay’s West Pond.